House clearance in London can be a challenging and time-consuming endeavour to complete. It involves heavy labour, filling out papers, finding transport, and heavy traffic. Luckily, you could save yourself the hassle by simply giving us a bell. 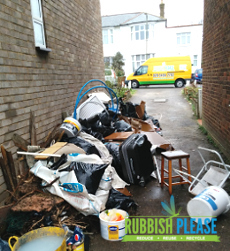 Rubbish Please is a proven, battle-tested house clearance company in London that will handle this tedious task for you in a fast and efficient manner. Years ago, our owners were scratching their heads over Londoners’ problems with rubbish and clutter and council’s inability to handle these matters quickly enough. Prices were steep, the service was slow or nonexistent and landfills were getting bigger by the hour. Thus came Rubbish Please - a household waste removal company crusading to right the wrongs of the house clearance market and offer a service worth bragging about. Many properties come to require complete house clearance due to neglect, overuse, bereavement, or simply for refreshment purposes. Landlords and family members alike require quality household waste removal and Rubbish Please is more than ready to deliver throughout London. Flats and apartments get cluttered at times just like houses do. We offer solid flat clearance in London to deliver apartment building residents from this problem. Basements are quite convenient for storing household items we don’t immediately need. Once the pile start pushing the ceiling, it might be a good time to consider basement clearance. When it comes to temporary storage, sheds have traditionally provided much-needed space. Overstuffing sheds with junk may become problematic but in those cases, Rubbish Please can help with a quick shed clearance. 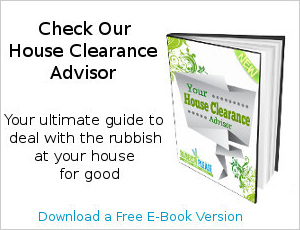 How much does London house clearance cost? Rubbish Please is well aware that anyone searching for ‘home clearance London’ is expecting to receive quality service regardless which particular area they reside in. For that reason, we are able to deliver flat and house clearance for properties all over London and Greater London without any extra distance charges. London is absolutely huge. This mega city covers a total area of 1,572 sq km (607 sq m) with a whopping population topping 8,6 million people or 5,197 Londoners per sq km according to the BBC`s 2015 data. The largest city in Europe experiences a substantial household waste removal problem further inflated by the so-called ‘Generation rent’ (more than 50% of Londoners rent their homes, according to Standard). As a direct result of having thousands of people move in and out every year, household items suffer accelerated wear & tear. Therefore more and more London landlords require fast & reliable residential clearance and this is where Rubbish Please comes in. Our trusted refuse collection company provides bespoke house & flat clearance for domestic properties our customers fancy quite a lot. For the 2013-2014 period, the government reports a total of 231,894 cases of fly-tipping in London alone. The environment, as well as our local community are overwhelmed with rubbish and the trend looks grim. Rubbish Please, in its capacity as a house clearance service provider is taking measures to fight pollution and littering by driving collected rubbish to specialised recycling centres. In addition, the affordability and ease of booking further reduce the likelihood people will opt for fly-tipping. Don’t Waste More Time - Call Us! Call 020 3404 5556 or enter the live chat and speak to our friendly staff. When you tell us what needs to be cleared, we can give you a quote for your specific house clearance in London. Alternatively, you can fill in the contact form and an experienced operator will get back to you as soon as possible with the most efficient ways to clear your house.